This acrylic desktop podium is ideal for your next tradeshow event or church outing. The church desktop podium ships unassembled for cheaper shipping costs. However, each countertop pulpit lectern takes just seconds to assemble! This desktop podium display has a large reading surface for holding multiple notes and reading materials. Additionally, each church lectern comes with a cleaning cloth and solution to keep the unit looking sharp at all times! 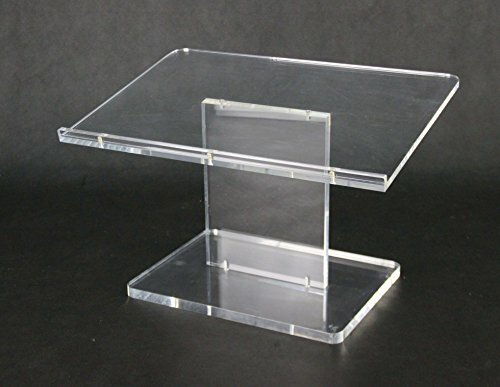 Specifications: Overall Width x Height x Depth: 22.0" x 14.3" x 15.3"; Base Width x Height x Depth: 15.8" x 1.0" x 11.8"; Weight: 19.0lbs; Material: Acrylic; Color: Clear; Placement Style: Counter / Tabletop. Features: Optional custom logo - contact cs@fixturedisplays.com for costing and lead time. Plastic or Acrylic Thickness: 0.5"; Top Surface Width x Depth: 22.0" x 14.8"; Book Stop Depth: 1.3"; Imprint Area Width x Height: 9.75" x 8".